By the late 60s the Hughes space business, now under the leadership of Bob Roney was picking up in all areas. The first Surveyor had landed on the moon in 1966 and was followed followed by four more. Hughes was building the Intelsat II series of satellites and new communication satellite markets were emerging. The first satellites had been for transoceanic communications but now national systems for countries like Canada, Indonesia and the USA were being considered. In1970 the Space and Communication Group (often called SCG for short) was formed under the leadership of Bud Wheelon. Bud formed four major divisions: NASA Systems, Defense (or National Security) Systems, Commercial Systems and a supporting Technology Division that provided hardware and people to the three systems divisions. Over the next 15 years the SCG organization became a major player in the world’s space program. At the top were four outstanding executives. Wheelon, an MIT PhD, who had been deputy director at the CIA before coming to Hughes. Roney, a Caltech PhD, was Wheelon’s principal deputy and would be called the chief operating officer in today’s parlance. Rosen, also a Caltech PhD, initially led the Commercial Systems business but then moved up to the Group level where he became what today would be called the Chief Technology Officer helping all aspects of the SCG business. A fourth executive, Paul Visher, with a Yale law degree, provided strategic support and advice to Wheelon’s management team. Between 1970 and 1985 the three major business units of SCG achieved numerous successes with a relatively stable management team. The NASA Systems team launched the Atmospheric Explorer and the Orbiting Solar Observatory scientific missions for the Goddard Space Center; The Pioneer Venus Orbiter and Multiprobe and the Galileo Probe for the Ames Research Center, geostationary weather satellites for NOAA and for the Japanese Weather Agency; the Multi-Spectral Scanner and the Thematic Mapper, key sensors for NASA Earth Observation program; and too many other programs to list here . Hughes won many awards for their NASA programs. SCG was a major player in National Security Programs and played a critical role in the stabilizing force of “eyes and ears” from space during the cold war. Most of the programs were highly classified but were a significant portion of SCG’s business during this time period. At the end the 90’s the existence of a major SCG customer, the National Reconnaissance Office (NRO) was declassified along with the SCG contribution of communication satellites that relayed information from low altitude imaging satellites to NRO earth stations. Some of the most challenging SCG efforts were for national security. The third System Division, Commercial Communication Satellites, became the dominant player in the rapidly growing communication satellite marketplace. Under Rosen’s leadership, a series of spin stabilized satellites tailored for national systems opened up new markets to complement the Intelsat business: companies in the USA, Indonesia, Canada, Australia, Brazil and Mexico all bought SCG satellite systems. Like all good markets new and tough competitors emerged but Hughes maintained a greater than 50% market share. Some very powerful and creative strategies were developed during this time period and led to the continued growth of SCG over the next decades. Ultimately many of these strategies were copied by competitors but none did it as effectively as SCG. The Satellite Bus A basic spacecraft (structure, power, controls, propulsion, telemetry and command)was designed to accommodate a customized communication payload for each customer. Thus SCG could benefit from mass production techniques to reduce cost and cycle time and increase reliability. The HS (standing for Hughes Satellite) 333, 376, and later HS-601 and HS-702 were all very successful “busses”. Complementary commercial and government programs and technology Having both major cost plus government and fixed price commercial business units under a common SCG management with a common technology support was a unique and powerful strategy with several distinct advantages. First it balanced workload so that if government business was down it was often offset by commercial business being up and vice versa. Secondly, technology developed in one area could often flow into the other, not just from the high technology of cost plus government programs but also the other way. Similarly efficient management methodologies developed to compete in challenging fixed price commercial programs could be applied to government programs; a feature appreciated by SCG’s government customers. Hughes Communications Bud Wheelon recruited a consultant, Tom Whitehead, a former Nixon advisor, who while working for the government, had advocated privatization of communications-the breakup of ATT-and “open skies” for satellite communications-permitting many operators rather than just the monopolists ATT and Comsat. Tom advocated Hughes entering the satellite services business, a significant move up the value chain, going beyond just manufacturing satellites. This would require Hughes to obtain licenses from the FCC, procure launch services, build supporting ground stations, and insure the satellite and satellite launch; all in addition to building the satellite. Furthermore Hughes would need to raise the finances to pay for the considerable amount of money required and then procure insurance and finally find customers for their satellite. All this would entail significant financial risk and would be a major move for a company that was accustomed to work for the government under cost plus contracts. 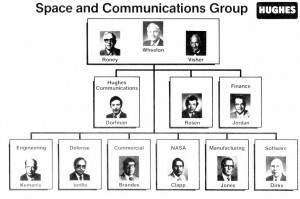 Another major issue was that Hughes would then be competing with its satellite customers, such as ATT and Comsat who were already in the services business and buying satellites from Hughes. They would be very unhappy with the situation and might prefer to buy from other manufacturers, damaging the SCG manufacturing business. The flip side of this was that manufacturing of satellite under fixed price contracts was becoming very competitive and the risk reward ratio was becoming more unfavorable while the service business was very profitable. This was a very important strategic decision for the SCG management. A Navy procurement precipitated a move. The Navy had decided to procure their next UHF communication satellite, to be called Leasat, as a commercial lease. Hughes elected to bid directly and in competition with Comsat. Hughes won, formed a subsidiary called Hughes Communication Incorporated (HCI). Tom Whitehead became president and CEO. Shortly afterward HCI launched three HS-376 satellites (called Galaxy 1,2 and 3) and entered the business of domestic USA satellite communication services. Leasat and Galaxy became very successful and profitable businesses. HCI applied to the FCC for licenses for direct to home TV satellites and mobile communication satellites and initiated expansion to ground terminals. Hughes Communication and the entry into the satellite services business profoundly changed SCG and ultimately Hughes Aircraft Company. At the end of 1984 the organization chart, shown below, was prepared for the information of prospective buyers.